TORONTO (Reuters) - The Canadian dollar edged higher against its U.S. counterpart on Tuesday as stocks and oil prices rose, with the loonie extending its rebound from a two-week low a day earlier. Calm returned to global markets as a steadier day for stocks and a tick higher in benchmark bond yields helped ease nerves after a jarring few days dominated by recession worries. "It seems to be similar to what we have seen recently where risk (appetite) has been driving the loonie," said Erik Nelson, a currency strategist at Wells Fargo in New York. "We are seeing relative outperformance on the back of higher oil prices and a pretty solid performance for stocks today. So CAD is getting a boost from that." The price of oil, one of Canada's major exports, rose as attention centered on geopolitical factors tightening supplies that are leading to falling exports from Venezuela and declining U.S. inventories. U.S. crude oil futures settled 1.9 percent higher at $59.94 a barrel. 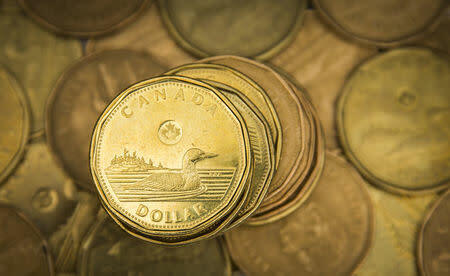 At 4:13 p.m. (2013 GMT), the Canadian dollar was trading 0.1 percent higher at 1.3386 to the greenback, or 74.70 U.S. cents. The currency, which touched its lowest level in more than two weeks at 1.3445 on Monday, traded in a range of 1.3373 to 1.3412. The loonie rose despite news that China has expanded its ban on Canadian canola imports to include shipments from Viterra Inc. The ban is the latest development in a wider trade dispute between the two countries that could weigh on Canada's economy. Canada's trade report for January is due on Wednesday, while January gross domestic product data is due on Friday. Canadian government bond prices were lower across the yield curve, with the two-year down 4.5 Canadian cents to yield 1.506 percent and the 10-year falling 19 Canadian cents to yield 1.571 percent. On Monday, the 10-year yield hit its lowest intraday level since June 2017 at 1.532 percent.